Hertha Kluge-Pott is a long-established and highly-regarded printmaker based in Melbourne. She was born in Berlin, Germany and arrived in Australia in 1958 after studying at the Hochschule für Bildende Künste and Braunschweig (Berlin Academy of Art) 1953-58. From the time of her arrival in Australia, Kluge-Pott devoted herself to a career in printmaking, both in making and teaching. She was a peer of the major figures in Melbourne printmaking at the time, including Graham King, Tate Adams and Udo Sellbach, and with them, an early member of the Print Council of Australia. She studied at RMIT from 1960-63, and had two etchings included in the important early national touring exhibition 'Australian print survey', organised by the Art Gallery of New South Wales in 1963. She taught printmaking in Melbourne from 1967, principally at Melbourne State College and RMIT, and her work continued to be shown in solo and group exhibitions of printmaking in Australia and overseas. Her work was the subject of a major monograph published in 2015 by Macmillan. 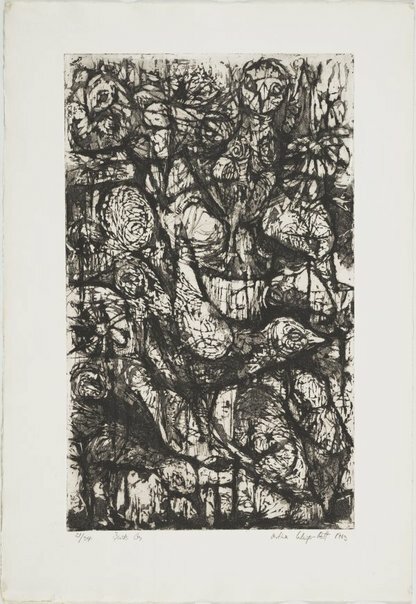 In 1981 Kluge-Pott’s work began to be influenced by the landscape and flora of the coast near Cape Bridgewater, in south west Victoria, a theme that has continued to the present in prints that have grown increasingly intense and monumental. "I am looking at the land intensely, but I am not interested in making the conventional picture-stage. I am trying to convey the feeling of turbulent upside-down-downside-up in an inside-out and outside-in place." (Sasha Grishin, 'Australian printmaking in the 1990s', Craftsman House, Sydney, 1997, pg. 152). Signed and dated, l.r. pencil "Hertha Kluge-Pott 1963".